now doesn't that make you smile? every detail is old and authentic. All the pictures were taken last Sunday at Bokrijk Museum Park, one of my favourite places for a photo walk. Welcome to the brand spanking new Summer Stock Sunday. Each week, beginning at midnight Saturday night Israel time, 5pm EST, we'll be sharing our quintessential summertime photos. So what says summer to you? Is it the pool? The beach? A backyard barbecue? A comfy old pair of flip-flops? Whatever summertime looks like in your corner of the world this is the place to come share it - put up your post and then come add your link to Mr. Linky. Visiting other participants is encouraged, after all, sharing is what blogging is all about. This meme is kicking off today at Robin's Around the Island. That's why I'm submitting these bonus pictures. There is so much to see, and so much to learn. This for instance is the beekeeper at work in his garden, and making an old fashioned bee hive. The only piece of furniture that has kept it's original place is the side table between the kitchen and the living room area. 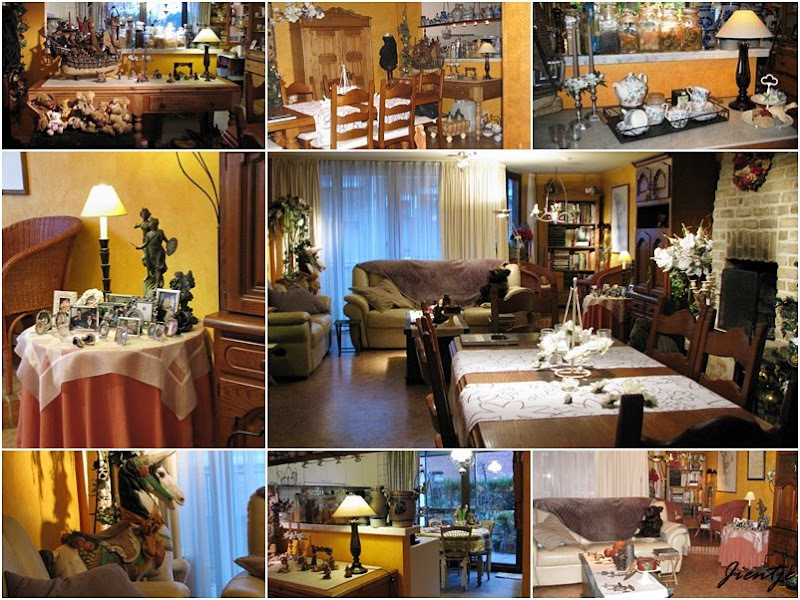 The sitting area is now in the middle of the room, next to the kitchen, and the dining table is at the front now. The whole place looks a lot more spacious and there's much more light coming in, which is great as we have no windows in the side walls. I rearranged and changed the decorations , and used the side table to display some vintage kitchen utensils that have been hiding in my closets for years. 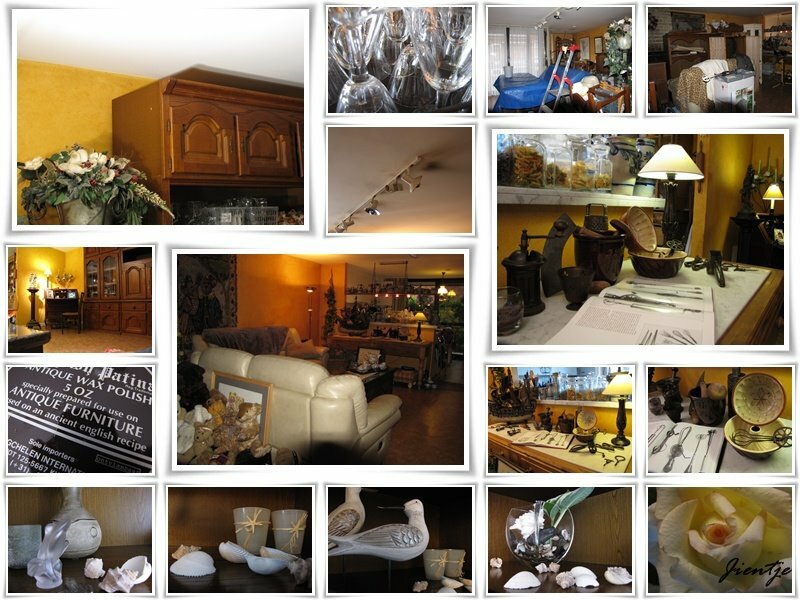 We used to browse flea markets and brocante shops for them on Sundays. But that was over twenty years ago, in an era when we were making plans to open a restaurant. The restaurant never happened, ( that's life I suppose?) and most of the "stuff" has been kept in boxes since we moved here. I think I have finally found some good use for it! I just love the fresh clean smell of soap and furniture wax, every time I walk into the room. I'm so excited and happy I finally found the energy to tackle this chore I had been procrastinating for years. I suppose it's like climbing a mountain, it looks HUGE when you're in front of it, but once you're on top of it, and you look back, you find it was well worth the effort. Another week is done, it's Friday AGAIN!! Last Fave Five for the month of May, where has that month gone to? It's a good thing I'm doing this meme to help me remember all the great moments, big and small, that I have enjoyed each week. Thank you Susanne for hosting this! He surprised me with a beautiful flower arrangement, and I cooked us a nice meal. The poor guy had to work, but in between appointments and business, we still got to celebrate with a glass of Champagne, and a nice romantic little dinner outside on our patio. 2. We had a break from cleaning and painting on Sunday. We went to one of my favourite places in Belgium which is Bokrijk Museum Park. One of the most photogenic places in Belgium, a place where the past is recreated to the tiniest little detail. 3. The rest of the week was all about the make over of my living room. Once painting the ceiling was done, I started to rearrange the furniture. The sitting area and the dining area have switched places, and the living room looks a lot more spacious now. We both love it, the room has a completely different feel to it now. 4. Washing all the glassware, and putting everything back inside the closets was another huge chore. It made me realize just how much "stuff" we've been collecting over the years! With a little bit of help from a good friend, we got the job done in an hour or two and still managed to enjoy a cup of tea together outside in the sun. 5. Furniture wax. I love the scent, and it has made my furniture look like new again, even after moving four times and twenty eight years of wear and tear ! Once that was done, I got to the fun part, decorating and adding the finishing touches. That's something I really really enjoy doing, and we both like how it looks now. 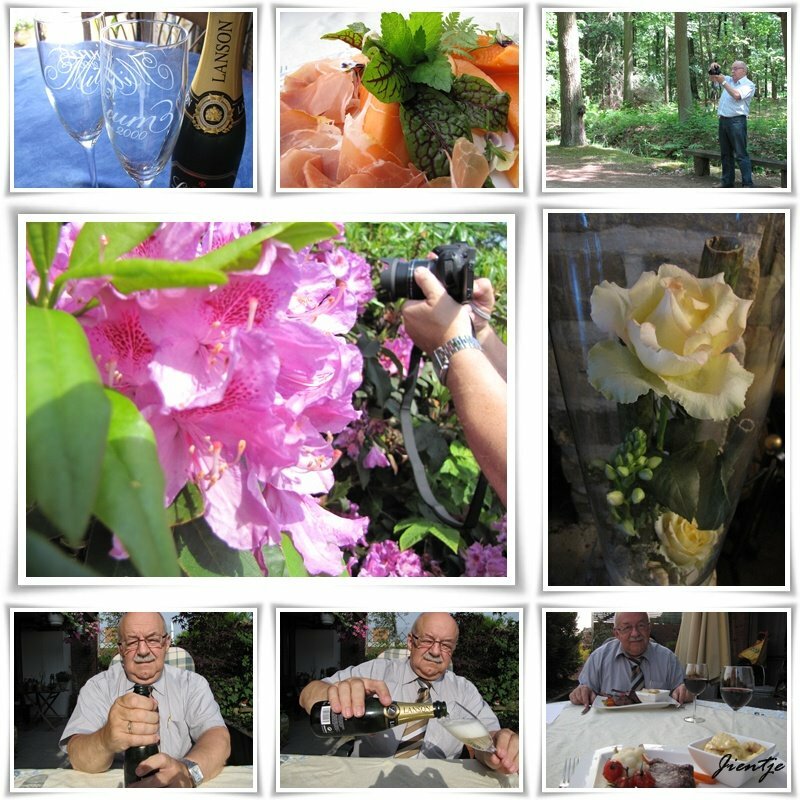 As you can see, it was quite a productive and memorable week with lots and lots of good moments to enjoy. Find more Fave Five participants at Susanne's Living to Tell the Story. It's been a while since I've done a Sepia Scenes, it seems. The nostalgic decoration inside the houses at Bokrijk Park Museum are perfect for Sepia Scenes. 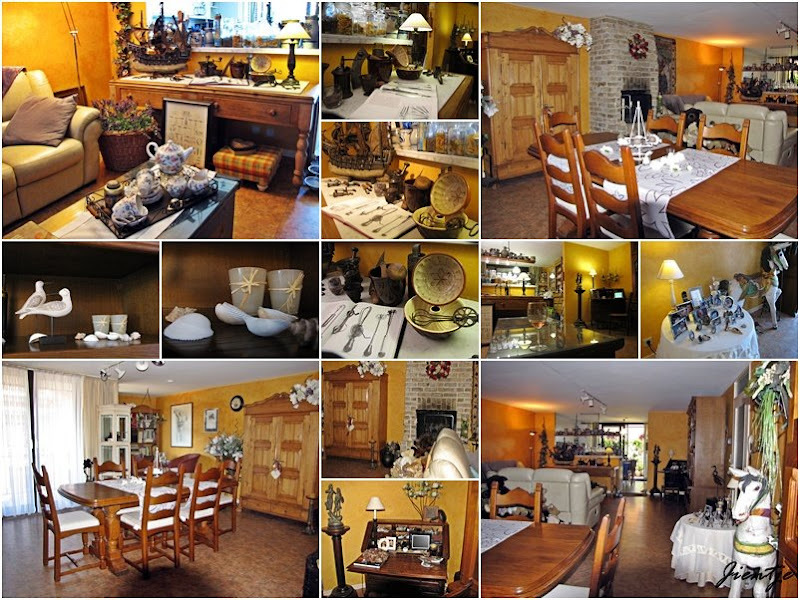 All the old houses at the Museum Park are decorated inside with the same old furniture, authentic utensils and tools our grandparents would have used daily. 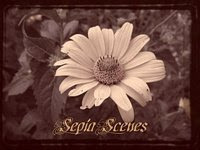 Find more Sepia Scenes participants here. As long as people have been around, they have tried to communicate with each other. As a means of getting the message across as clearly as possible, idioms and sayings have found their way into our language. 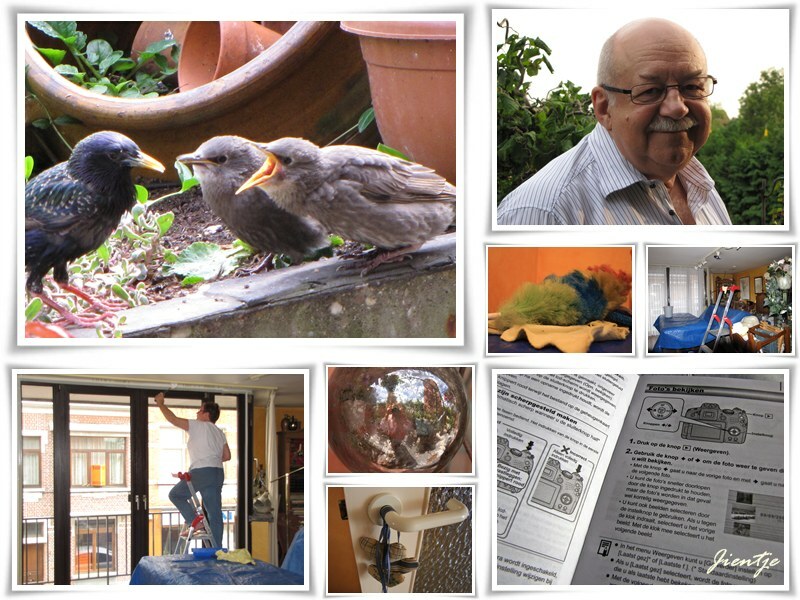 Now, because "a picture paints a thousand words", I thought it would be nice to make this a photo challenge. 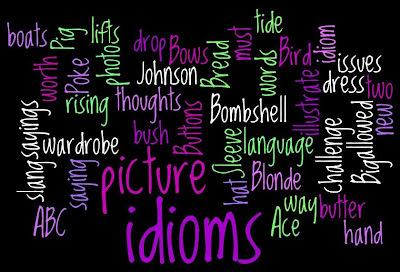 The idea is to choose an idiom, or a saying, ( even slang is allowed) and illustrate it with a picture. Each week we'll cover two letters of the alphabet, okay? You can find the first edition here if you need some inspiration. "You have made a mistake and I am going to call you on it. You are in trouble (a threat). I have a disagreement with you. I understand your true nature." This means: things, especially education, that affect and influence us in our childhood shape the kind of adult we turn out to be. I'm very much looking forward to see what you've come up with? Don't forget to sign the Mr Linky if you're playing, and please, add the link to your POST, not the homepage, okay? In between all the hard work with our living room make over, we still managed to squeeze in a photo hunting walk last Sunday. We visited one of my favourite places here in Belgium, the Bokrijk Museum Park, an open air museum, where the past is reconstructed to the tiniest little detail . A photographer's paradise. There will be more to come in the following days. Look for more Ruby Tuesday pictures at Work of the Poet, and please say hi to Mary the Teach, because today is the Anniversary of this meme, one year already !!! 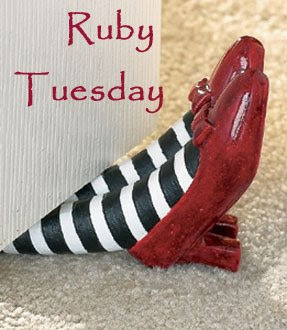 Happy Anniversary Ruby Tuesday, and thanks for hosting this fun photo meme, Mary! On the first night I had my new camera, only minutes after I had received it, and started looking for photo opportunities on my patio, this friendly little fellow ( I think it's a bee?) seemed to be more than willing to pose for me. and letting me take pictures from every possible angle! 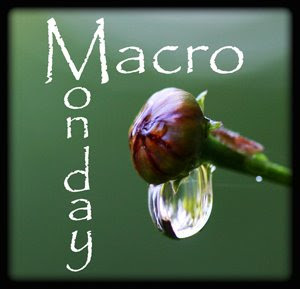 For more Macro Monday pictures, visit Lisa's Chaos. 20x zoom, I mean, look at that!! I did not get much chance to really try it out yet, but I'm going to do that today!! I'm off on a photo walk today!! Find more Weekly Winners pictures at Sarcastic Mom's. Friday's Fave Five, What a Week!! It's time to look back on the week that has been and share some of my favourite things . And what a week it has been!! 1. My number one has got to be my husband this week, or any other week for that matter!! He has moved heaven and earth to get me my camera, and he has succeeded!!! I was convinced it would not be happening for me this week, but he MADE it happen. The look on his face was priceless when he stood before me with a package hidden behind his back , and I'll bet you could all hear me yell when I opened it!! 2. A new look for my living room!!! My poor husband has been great helping me out with my living room project. It was 1.30 AM before we finally went to sleep last night! He's been helping me moving all the heavy stuff from one side of the living room to the other, disconnecting and reconnecting the TV, DVD, stereo ... Everything but painting and cleaning, which is my assignement!! UPDATE: It's now 17:47 PM and the job is DONE!! Woohoo!! No more painting!!! Finito!!! * Does the happy dance!!! * Let the fun begin! 3. My new camera of course. The new Canon SX10 IS, I love it!! Many of you have asked about it, so I'm adding this video review for you to enjoy!! 4. Chinese take out food! You gotta love take out food when you're too busy to cook!! 5. The European Starling mother and her baby's goofing on the food I've put there have given me the perfect opportunity to try out my zoom lens!! 20x zoom means I can zoom in from my kitchen and photograph them without having to disturb them!! Awesome!! More Fave Five's at Suzanne's Living to Tell the Story.